The panel is one of the first altarpieces painted by Botticelli, datable to around 1470 for the stylistic affinities with the figure of Fortitude (Uffizi Gallery) painted in that year. 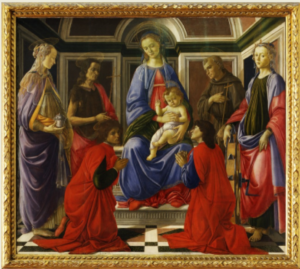 The female saints recall the figures of Filippo Lippi, Botticelli’s master, whereas the background architecture – with predominant polychrome marbles of classical inspiration – and the masterly execution of drapery, are referable to Verrocchio, in whose workshop Botticelli completed his education. The slightly differing lines of the Madonna visage are due to a XVI century repainting. The provenance of the painting is the Florentine church of Saint Ambrose, but it is not certain that was the original destination; the representation of Cosma and Damian, the physician-saints identified by the inscriptions S. COSIMUS – S.DAMIANUS, justify the idea of a commission connected with the Guild of Physicians and Pharmacists or with the Medici family.